These are the small buses or large taxis of the Philippines. I got to ride one, which was quite fun. You can ask them to stop anywhere on their route. Before you get there you hand your fare to the person next to you. It's passed along until it gets to the driver. Then your change is passed back. 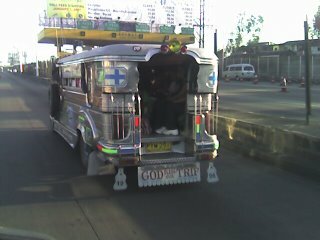 Each jeepney has it's very own artistic design, and many of them have Christian themes. Dr. Donahue who arranged several of my performances and workshops wrote an article on the theology of jeepnies.